Well known for its volatile geothermal activity, the region is said to be the site of one of the largest volcanic eruptions ever recorded. Indeed, in 186AD, an explosion occurred that was so fierce that even the Romans in Europe recorded ash falling from the sky. In the aftermath of such an event, a crater lake was formed, which today is said to be the largest freshwater lake in the southern hemisphere – Lake Taupo.Measuring roughly the same size as the sovereign city-state of Singapore, yet nestled in the heart of New Zealand’s North Island, the great freshwater lake of Lake Taupo, and the settlements ringing its shores, are an exciting destination for any lover of the great outdoors. When the Maori first came to the region they were in awe of the lake’s immense size and geothermal activity. Legend has it that when the great Maori explorer and chief, Tia, travelled along the shores of the lake, he noticed that its cliffs resembled his heavy rain cloak and thus named the region: Taupo-nui-a-tia - “The Great Cloak of Tia”. Today this name has been shortened to just Taupo. In 1869, the first Europeans arrived and settled the town of Taupo. 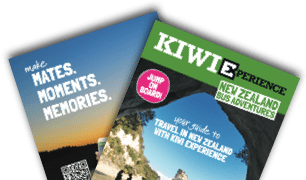 Today the region is widely recognised as the ‘Adventure Capital of the North Island’ with many heart-pumping activities from sky diving to jet boating to white water rafting. 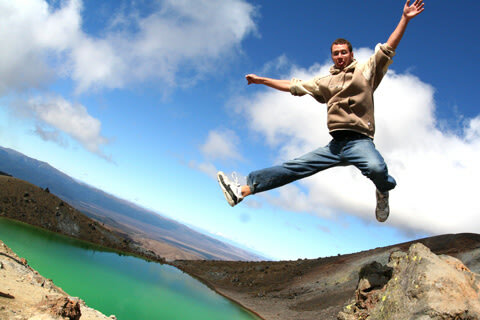 Indeed, Lonely Planet in 2012 named the region as one of the best places for daredevils to visit in New Zealand. 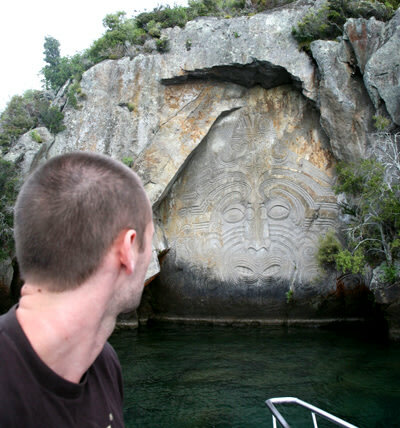 Start your visit to Taupo with a cruise on the Lake to experience the famous Māori rock carvings at Mine Bay. Carved in the late 1970’s, the frieze depicts Ngatoroirangi, the legendary navigator who guided the Tuwharetoaand Te Arawa peoples across the Taupo region a thousand years ago. Sail Barbary offers eco-friendly tours of the Lake onboard at beautifully restored 1920s yacht from $35NZD per person. After that, take a short bus ride north of the town to one of New Zealand’s most popular natural attractions – the Huka Falls. Witness the raw power of more than 220,000 litres of water per second gushing through a tiny outlet just 20metres wide. Take the 30 minute riverside walk around the Falls and snap a selfie on the footbridge above the wild white water; or if you want to experience the waterfall at a more spectacular angle, board the Huka Falls Jet Boat for a heart stopping ride at over 80km/h ($99NZD). For many travellers, one of the most popular activities in Taupo is the bungy jump; and the thrills and spills don’t get much more extreme than as 47meter free falling Water Touch Bungy jump into the Waikato River with Taupo Bungy. Alternatively, take the Taupo Cliff Hanger and swing out over the Waikato River Valley. The swing is an extreme ride that races towards the blue river waters before arcing up to nearly 180 degrees at 70kph. Enjoy both experiences with the Bungy Swing Combo for $238NZD. If plummeting through open air is something you just can’t get enough of, then why not also hurl yourself out of a Cessna plane with Skydive Taupo? 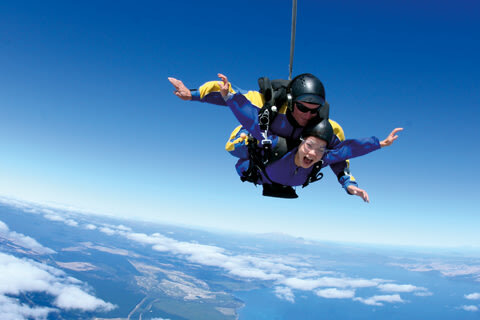 Cruising high above stunning Lake Taupo with panoramic views of snow-capped volcanos in the distance, experience a one minute free fall at speeds pushing 200km/h. WITH SKYDIVING PRICES BEGINNING AT JUST $249NZD FOR A 12,000FT SKYDIVE, TAUPO IS ONE OF THE CHEAPEST PLACES TO SKYDIVE IN NEW ZEALAND. If you’d prefer to keep your feet firmly on the ground then it is highly recommended that you spend the day exploring the Tongariro National Park. This UNESCO World Heritage Site boasts one of the best day walks in the world - the Tongariro Alpine Crossing. Speak to the guys at the Tongariro Expeditions about hiring a guide to take you over the active volcanic terrain where you will see an ever changing landscape and past the steaming thermal pools. Speaking of geothermal activity, walk the boardwalks of the active geothermal field at Craters of the Moon (karapiti). The uninhabited landscape was used extensively in the filming of the Lord of the Rings trilogy. Indeed, many of the areas around Taupo and Tongariro National Park played canvas for the mythical Middle-Earth in the films. See if you can spot the locations of Mordor, Emyn Muil, Mount Doom and the Plains of Gorgoroth. BaseX Taupo: Located just seconds from the Lake shores, Base offers clean and comfortable rooms (including a girls-only dorm) with free towels and complimentary 15 minute internet card. The superior facilities include a modern kitchen and laundry as well as its own club scene at Element Bar. 8 bed shared dorm rooms start from $24NZD per night, while a double ensuite room will set you back around $36.50NZD. Taupo Urban Retreat: A clean and modern stay with a self-titled ‘funky urban vibe’, Taupo Urban Retreat is a great place to relax after a wild day of bungy jumping and skydiving. Dorm rooms begin from $25NZD per night and include lockable storage and heating. In addition, the hostel has laundry and kitchen facilities as well as one of the cheapest bars in town. REMEMBER THAT WITH KIWI EXPERIENCE, YOUR FIRST NIGHTS ACCOMMODATION IS GUARANTEED IN TAUPO.